I don’t know about you but I LOVE mercury glass! Mercury glass vases, mercury glass candle holders, mercury glass owls or pumpkins… colored mercury glass – any and ALL of it. But I what I don’t love is the price. 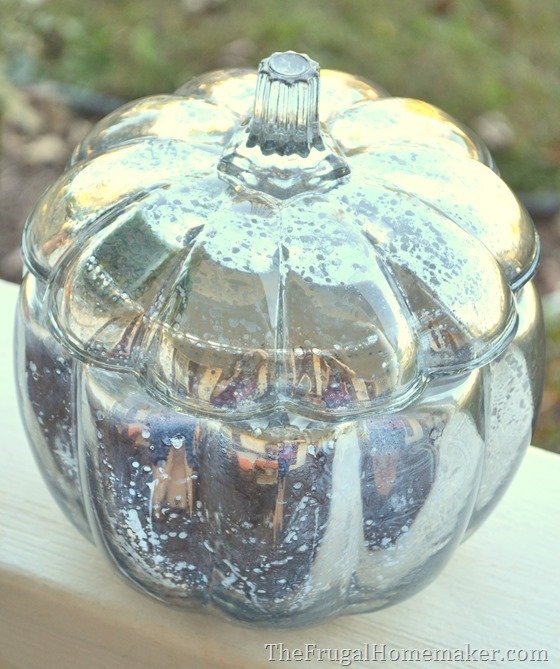 $50-60 for mercury glass pumpkins… no thanks! I am the ‘”frugal” homemaker after all. So when I saw that Rust-Oleum was coming out with a brand new spray paint called Rust-Oleum Mirror Effect, I was excited. I love Rust-Oleum products and knew this was going to be good. I got to see a preview of it at Haven Conference in August before it even hit shelves. You all loved the vases created with it that I shared on facebook. 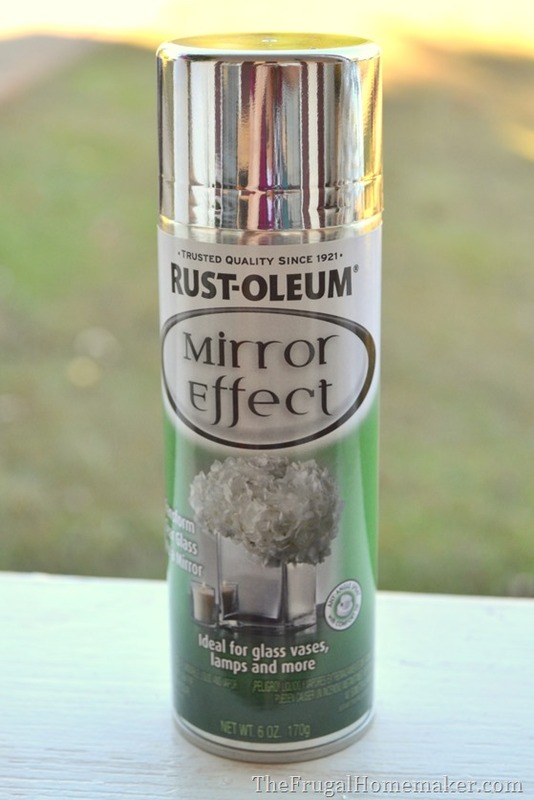 You should be able to find it at your local craft store, home improvement store, or you can buy Rust-Oleum Specialty Mirror Effect from Amazon (affliate link). 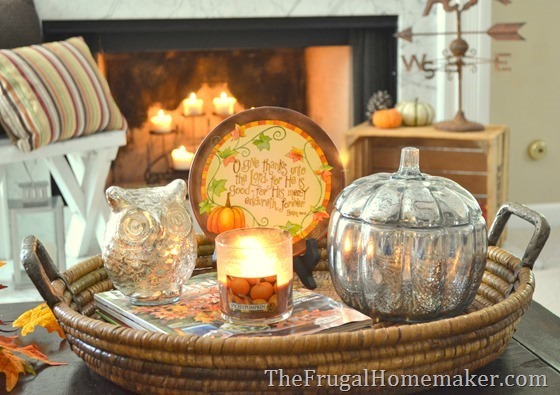 I just happened to find this glass pumpkin candy dish at a thrift store for $1.00 a week later, and I knew EXACTLY what I would do with it! 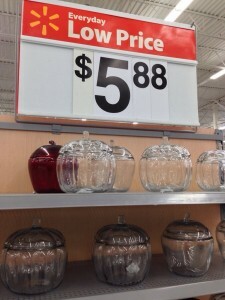 By the way, if any of you are wanting to pick up the same glass pumpkin and don’t find one at a thrift store, Walmart has the same glass pumpkin and apples as well. The way this spray paint works is you have to spray the opposite side that you want the mercury glass look to appear on. 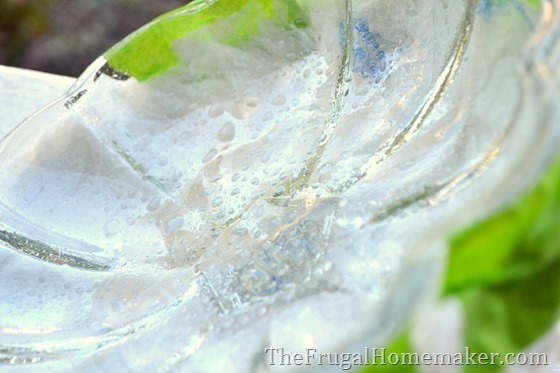 So you will want to spray the inside of the vase, pumpkin, candle holder or whatever you are turning into mercury glass. I taped off the outside so I wouldn’t get overspray on it. And then lightly misted the inside with water. LIGHTLY mist it. Then while it is still wet – spray with the spray paint. Follow the directions on the spray paint can – make sure to shake vigorously for at least a minute before use. It will turn to a mirror finish within a minute. Here’s what the inside of the pumpkin part looks like. I let mine dry for about an hour or so. If you want a darker/less transparent finish you may want to do a second coat. I like my mercury glass to be pretty splotchy looking. So I rubbed the inside of the pumpkin with a wet paper towel very gently to remove some more paint. And this is what I was left with – LOVE! Here’s some tips for you. This paint CAN and will scratch off if used in a vase where flower stems will be scratching it, etc. To prevent that once the paint is dry, protect it with 1-2 coats of a clear protectant like Rust-Oleum Ultra Cover 2X Matte Clear. I could use it anywhere – but for now I have it on my coffee table serving as a pretty, disguised candy dish! 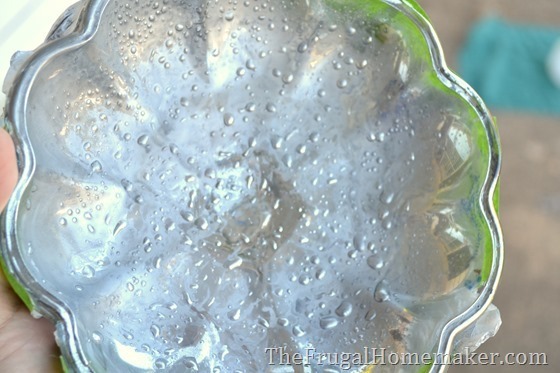 The owl is “storebought” mercury glass – can you tell a difference? 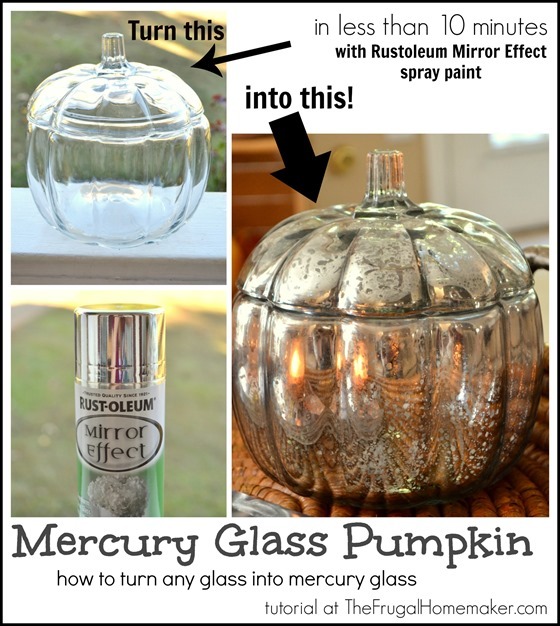 $1 pumpkin + less than $10 can of spray paint that you won’t use very much of at all = frugal mercury glass… my FAVORITE! Now for the fun part! 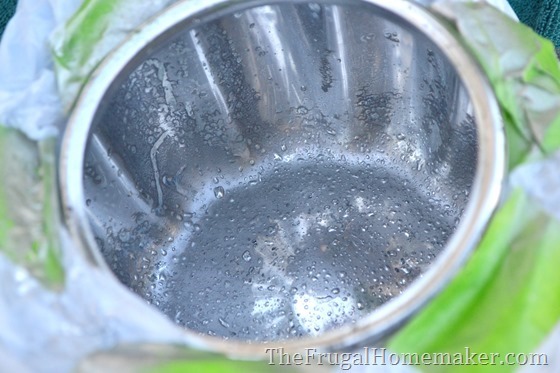 Would you like to make some frugal DIY mercury glass? A pumpkin, vase, candle holder glass shelf, Christmas ornament, fix a mirror, etc? Great news… because one of you is going to win a CASE (6 cans) of Rust-Oleum Mirror Effect spray paint. Use some to create some of your own projects and maybe share a few cans or give a glass item and a can to a friend that loves to DIY (great Christmas present idea!). I would totally love to get spray paint in MY stocking! Enter to win in the rafflecopter widget below (if reading by email, click over to the post to enter.) Winner will be announced next Wednesday. I love mercury glass also! I would use this paint on an old hurricane glass candle holder and use as a Christmas centerpiece with a red candle! 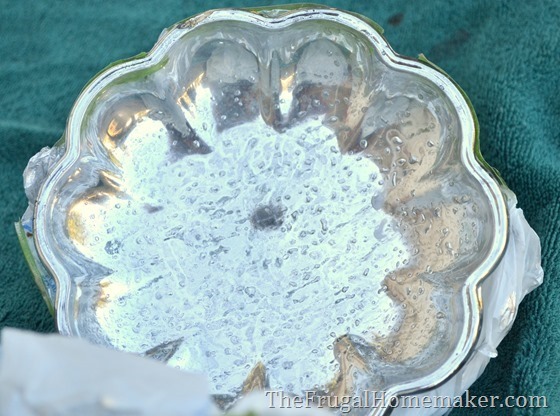 Ah, mercury glass….one of my decorating “loves”. My Pottery Barn catalogs are full of it, but I can’t afford it 🙂 Although if I win some of this paint, I might be making myself all manner of decor for the holidays! Oh, and I would paint some glass Christmas trees for my mantle….and some ornaments for an all-natural/neutral tree. 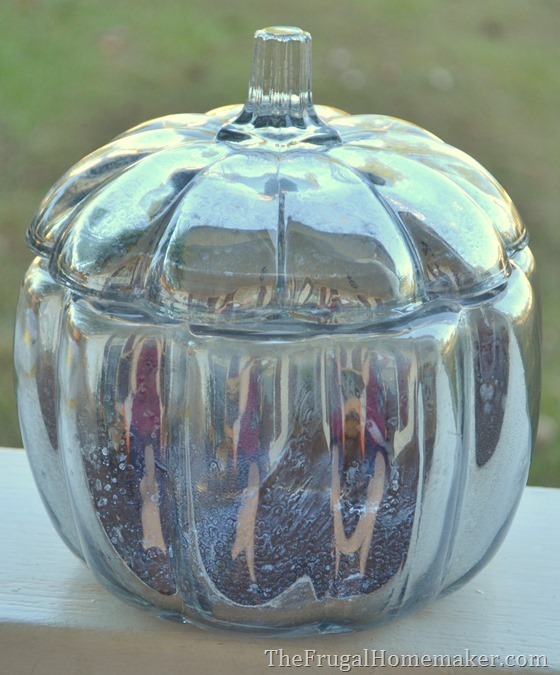 I love how your mercury glass pumpkin turned out! I saw one of those glass pumpkins at the thrift store just the other day….. I would love to do a mercury glass pumpkin, ornaments for my Christmas tree or transform glass candlesticks I bought at Goodwill not too long ago! I can’t wait to try it on a pumpkin! That is lovely!!! I would start by using it to make vintage looking Christmas tree ball ornaments for my tree! Wow ! What a great giveaway! Oh, the things that could be transformed with that! Decorations for the tree and centerpieces! I would definitely head over to my thrift store to find a treasure like your pumpkin. Great up cycle! I love mercury glass! I want some mercury glass lamps for my dining room buffet so bad. Your pumpkin turned out great, love it! Also love your blog! 🙂 God bless! I LOVE this look! 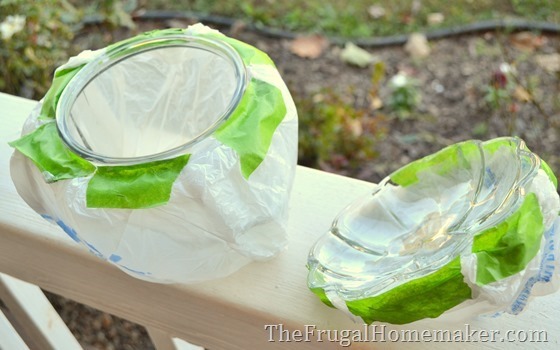 I have seen this done with vinegar (spray paint it first and then mist vinegar/water mixture. This seems like it might be easier. I will give it a try! I love love love your blog!!! You’re my inspiration for oh so many things. I really am just a copycat though :). I have mirrors on my walls and can’t wait to spray paint other stuff too!! Maybe even the outside of a clay pot. I just ordered two mercury glass candlesticks from Decor Steals. Now I can make my own!! Thank you Christina!! I LOVE this!!! I am a huge Mercury Glass person. I want to use mercury glass when I get to redo my mastet bedroom! I love the way it shines! I can think of LOTS of uses….One that comes to mind is to paint a tray or large plate! I could definately come up with more as well! I love the look of mercury glass and would like to try my hand at making my own. Just saw those pumpkins at Walmart too. Thank you for the inspiration! Love it! What an innovative idea! That Haven conference must have been awesome. I am loving all the new paint products that have come out in the last few years. Thanks for the idea. I love your fall decorating series! Would love to try this out – haven’t used any of these specialty spray paints yet – this would be the PERFECT opportunity! Thanks for the chance! I have a glass cylinder that I would love to try this on. 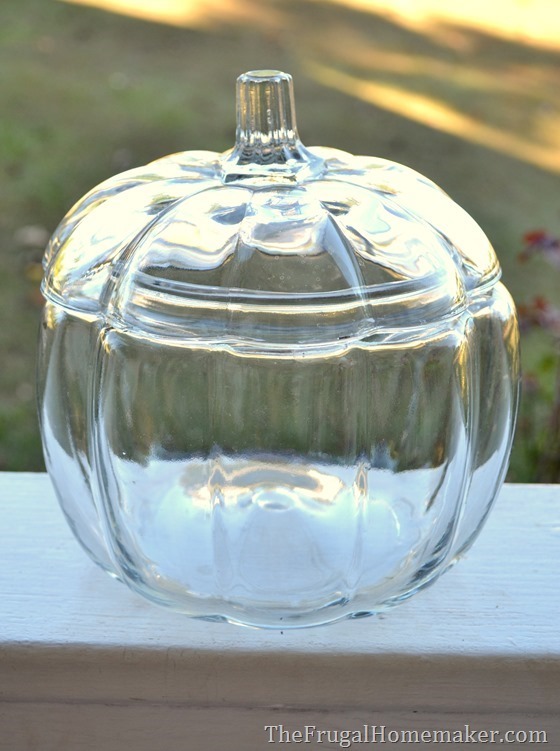 Also have seen glass pumpkins before at Goodwill and will definitely buy one. Thanks for showing this and it is beautiful!! Love this idea!! I have been on the hunt for some large glass or acrylic balls to do something like this with. I want to sort of create a gazing ball effect for vignettes. No luck yet, but I hope to find some before the holidays!! I would like to try this paint on some Christmas decorations. I can think of some people who would love to receive it as a Christmas present, too. I would love to win this! I just love your projects but this one is so simple and over the top! love it! so simple to do and such a fabulous look! Thanks so much for the tutorial, very informative! I’ve been wanting to do this so to win the paint would be great! Thanks! Great tutorial. I’ve wanted to try this as well. I’ve been looking high and low at all my local craft and hardware stores and cannot find anyone who carries this paint – would love to win a case to use and share. Thanks for the opportunity to win! I think I would start with one of my vases. So fun! LOVE your pumpkin!!! Great job! The spraying with water first to create the mercury glass effect after using the Rustoleum is totally genius. What a fantastic use of an easy-to-use product. Kudos! I’ve had the mercury glass paint for a while now, and still haven’t tried it! I’m so glad I came across your post today..I know what I’m doing when I get home! Love this idea! I have the exact same pumpkin, and was ready to get rid of it until I saw you post! Now I want to try it too! I would paint a couple of interestingly shaped glass vases that I got at a flea market. I am LOVING this idea. I would spray a vase, decorative bowl, just about anything I can get my hands on that’s glass. LOL! Bethany recently posted..Throwback Thursday: Amen! This is BEAUTIFUL!! I had been looking for the looking glass spray paint that was out a year or so ago, and have been unable to find anywhere! So glad there is another product to take its place!! I could do A LOT of beautiful things with just ONE CAN – a case would be an AMAZING gift! I LOVE the look of Mercury Glass. I am wanting to paint votive candles for a party. They would be beautiful on the tables at night. Love this idea! I can’t wait to try it out! I love this! I am going to try it as soon as possible. i would paint some vintage votive holders! I wanted to make some Christmas tree ornaments last year and now I remember how badly I wanted to do it. LOVE this paint. Love the idea for anything to hold a candle because the sparkle cast off from the flame would be magical! Thanks for the inspiration and giveaway! Beautiful tutorial! Can’t wait to try it on Christmas ornaments! This is an awesome idea. So many things I want to make now. Your pumpkin turned out great! What a cool product and project! I think it would be fun to try clear Christmas ornaments painted. I think it would look great winter decor! Looks like fun to try! Had no idea how easy it was!! Really cool! I would also like to make some matching candle holders as well!! 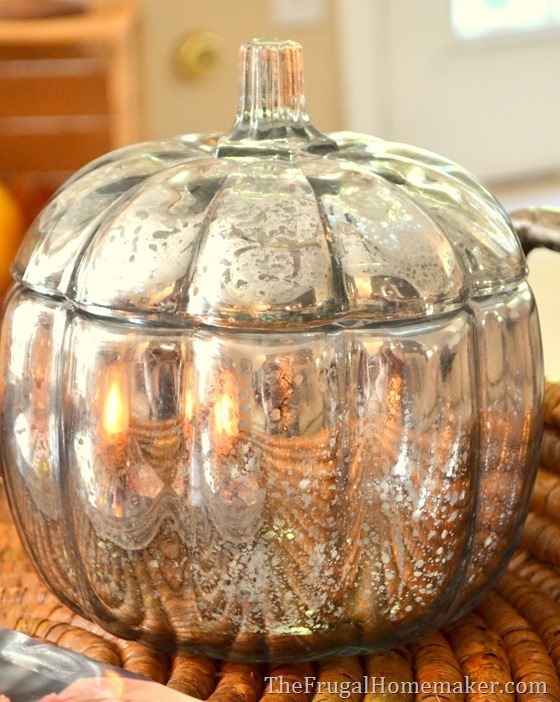 I am so in love with your mercury glass pumpkin – I want to run out to Wally World right now so I can make my own!! I’ve been dying to try out this spray paint and I think my first project would be lamps for my bedroom! SO fun! I wonder – is the paint non-toxic? I’d love to try it on some glass plates. I have a couple vases with lids that were used in my wedding decorations years ago that I have put away because they don’t fit with my décor anymore. I would do those so that I can display them again! First think I would paint is a vase, then ornaments. So pretty! Thank you for this lovely tutorial–can’t wait to try it! Lovely! Where can I get this paint? I see it in a very small spray can for 12.99 at two different stores!! Do you know where I can purchase it at the cheaper price you mentioned? Getting ready to do my first base right now! Thanks for the tutorial! I don’t know how I missed this at Haven. I am so excited to read about this new product and how easy it is to transform everyday glass pieces into something beautiful. I love the look of mercury glass,and with the help of Rust-oleum I will be able to have some. I have a can of gold paint, think I could do something like this with it? Do I first paint it white inside and then spray the mirror Rustoleum spray over it when it is dry? Can you use a tea candle inside when spraying the inside of the items you paint or is that not safe? Love this!!!! Thanks for sharing !!! Can’t way to try this! Love..Love mercury glass but it was to pricey for my budget. Can’t wait to try this! Love this so much! Already have one of these pumpkin jars and will be doing this!! Also, absolutely love your wicker table tray with handles!!! Have been looking for something exactly like this!! Can you please share where you purchased this? Oooh have pumpkin at home. Would love a can! Have one of these at home and would love to do this. So festive!